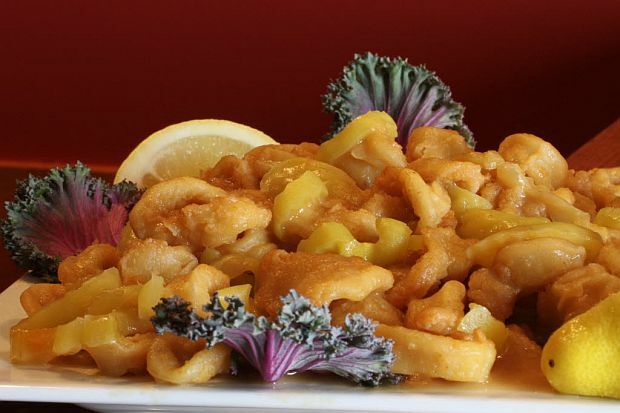 In September 2011, Providence Journal Food Editor Gail Ciampa published our fried calamari recipe many readers had enjoyed here at the restaurant. This is our most popular appetizer and it was featured as a part of the Journal’s “Chef’s Secret” series. For the calamari preparation: Flour squid rings in the fish/chicken flour. Cook rings in a stock pot with canola oil on medium heat till rings turn a golden brown color. For the sauce preparation: In a sauté pan add the oil, garlic, crushed red pepper and black pepper. Cook on medium heat till garlic turns light brown. Now add brown gravy, wine, pepper juice and butter. Stir and simmer for 5 minutes. Add squid rings in the sauté pan and toss. Editor’s note: For the fish and chicken flour, check out McCormick’s Seafood Coating Mix, Golden Dipt or a similar batter product. Marchetti’s makes its own brown gravy but you can buy a good quality light brown gravy for this recipe. Serves 3 to 4 people. Reservations are gladly accepted for any party size. Please give 48 hour notice for parties of 12 or more. Casual atmosphere, ample parking, and wheelchair accessible. We offer a children's menu and have highchairs and booster seats. Gift Cards are available. Stop by during regular business hours or call to have it mailed directly to the recipient. *All major credit cards accepted.